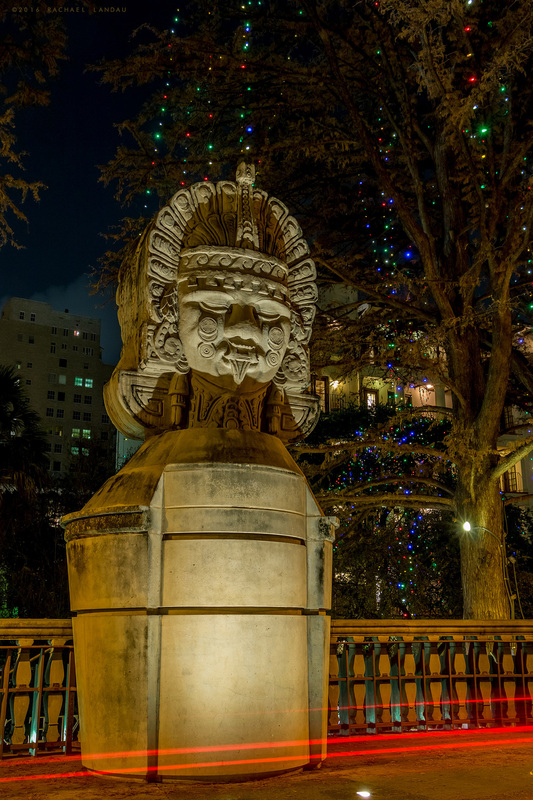 A Meso-American sentry stands on the street level above the busy Riverwalk in San Antonio, Texas. I had to set up my tripod in the street to make this shot. There were no pedestrians nearby to use for scale, but the sculpture could easily have been 12-15′ feet tall. I gambled correctly on not having to move out of the way of vehicular traffic, though a car did pass by during my exposure. That’s why you see the red light trails streaking across the bottom of the frame. Unbeknownst to me, I was standing directly behind the Aztec Theatre, a prominent architectural landmark in its own right. Really nice shot and colors are beautiful plus historic shot.